After a good 5 months of ever wondering if winter was going to end, we find ourselves in a spell of very warm weather not dissimilar to very high summer in the UK (when the UK gets a summer, that is). We are beginning to learn that, as a country, Spain doesn’t do much by halves. We have learned that, in the winter, every night will be cold (2 duvets, a blanket and hot water bottle cold). We have learned that, when it rains, it rains hard and consistently. In the UK, we became inured to mild winters, drizzly days, nondescript springs and equally bland autumns. Here, seasons are clearly punctuated, and whilst we know that this week’s spell of warm weather may not last (just yet), we do know that Spring has sprung. So, after a fairly busy week, with one thing and another (and yes, we are well aware that many of you out there do wonder what we do all day, and this will be addressed in a podcast, soon to be recorded! ), we decided to treat ourselves to a trip to the beach. 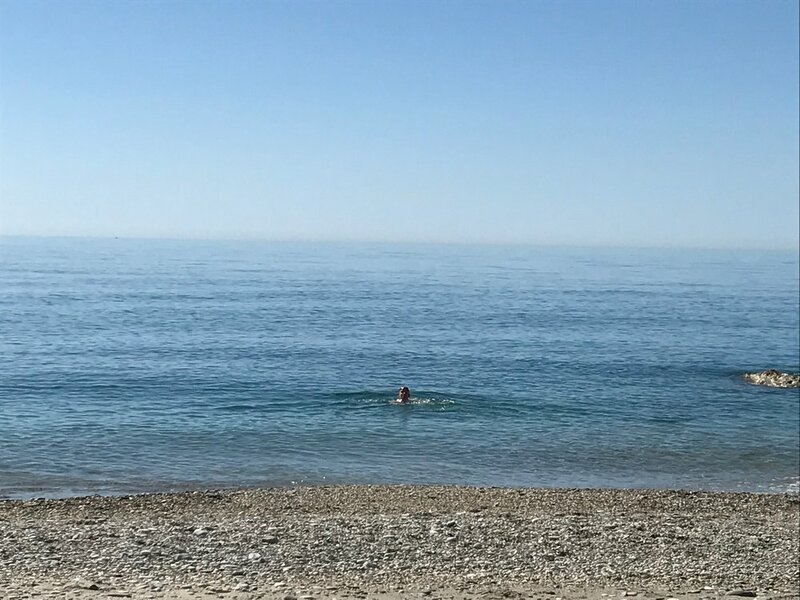 I have been coming to Andalucia for the best part of 21 years, on and off, and have always (naively) assumed that every beach along the Costa del Sol came with a settlement attached. Some of these ‘settlements’ are fairly grotesque affairs, and others have their own certain charms. However, never did I believe that there were stunning beaches similar to those found on the rugged west coast of Mallorca. How wrong I was. 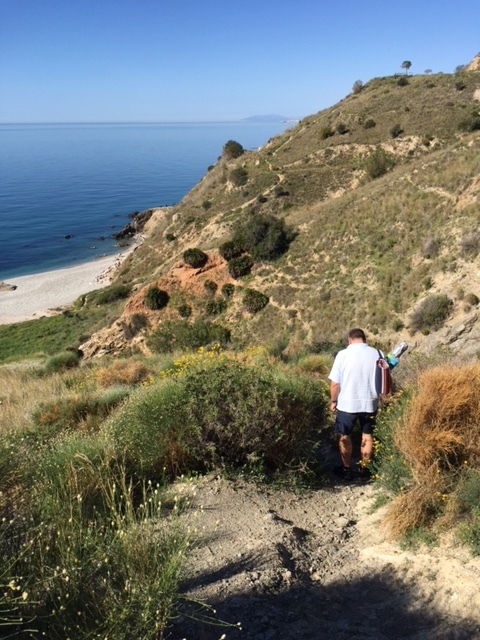 We read, a few months ago, that there was a stretch of coastline that ran from La Herradura to Maro, just on the eastern edges of Nerja, so went to explore. Sure enough, the road (the N340) runs along the cliffs and affords the most tantalising glimpses of hard-to-reach coves and blissful turquoise waters. On New Year’s Day we took our first proper trip to one of these beaches, Playa de las Alberquillas, and it was perfect. The weather was calm, sunny and mild - ideal for a post-Christmas stroll along the shore, skimming stones and clambering over clutches of rock. It was clear that this would be our beach of choice come the warmer weather. So, the warmer weather has now arrived, and off we drove, heading for another of the beaches along this stretch, but it might make sense to list the beaches by geographical location along the N340. We come off the main A-7 Autovia at the Almuñecar (Oueste)/La Herradura junction, approaching it from Motril, and from this junction it is easy to pick up signs for the N340 (signposted Nerja and Málaga). The road starts to weave its way up into the hills above La Herradura (itself and very attractive town with a great stretch of beach, if you like to be close to facilities for your day by the sea. Out of main season, this is a lovely destination. The first of our favourite beaches is Playa de Cantarriján, difficult to identify! There is a car park on the left hand side of the road with a large ceramic sign bearing the legend ‘La Herradura’, and if you pass this you have gone too far! In the first car park, there is a concrete track that leads downwards, just to left of the car park entrance. It might look like a private drive, and it is quite steep in parts, but it is well made and safe! In the height of the summer, visitors are encouraged to park in the car parks at the top and wait for the shuttle transfer. I doubt if we will ever go during the weekends at height of summer, as crowds are not our thing. We will stick to weekdays…. Playa de Cantarriján is a designated naturist beach, but don’t let that put you off! It is not obligatory to let everything hang out the minute you hit the shingle. The reason to go to this beach is La Barraca bar and restaurant. This is a lovely spot, with plenty of shade provided by the rather delightful gardens, and the front terrace literally steps onto the beach. This is a wonderful place for people-watching (people watching, not voyeurism! ), and the food and service are both pretty impressive, too. Fresh fish (as we experienced on New Year’s Day) is laid out on ice, you pick the fish you want and it is cooked to order - delicious. The Berenjenas Barraca are well worth selecting, too, particularly if you want a light lunch. The beach here is divided into two parts by a natural rock formation; you can either nip around the headland, risking wet feet, or scuttle through a hole in the cliff to get to the more ‘private’ part. Why does everything sound vaguely smutty whenever naturist beaches are being discussed? Anyway, go to this beach, and La Barraca, for lunch - highly recommended. Further along the coast, the next beach to be signposted is Playa del Cañuelo, and we have to admit we have not yet been to this beach. Although there is a track leading down to it, this appears to be closed to beach traffic, and it appears that you have to park in the car park at the top and walk down. After a very hectic couple of hours on another beach, the prospect of a long walk downhill and, even worse, the return trek, did not appeal. We will report further when we have bitten that particular bullet. The next beach along this route is Calas Torre del Pino, and it was here that we pitched our newly acquired beach parasol, and spread out our towels this week. There are one or two laybys just off the road, and this is where you drop your car. You need to be fairly intrepid to take one of the handful of tiny footpaths down to the beach, but it is worth it in every possible sense. The views on the way down are spectacular, and when we went this week, the sea was like a mirror, and the colour was a crystal mix of turquoise and aquamarine: almost impossibly perfect. At the foot of the cliff, the path all but disappeared into a meadow of bright wildflowers, but within moments the meadow gave way to pebbles and shingle. The last in our little tour of beaches along this stretch of road, known as the Maro-Cerro Gordo section of coastline, is the above mentioned Playa de las Alberquillas, and again, there are lay-bys just off the road where you can park. The track down to Alberquillas is not as challenging as the footpaths to Calas Torre del Pino, and the beach is no less spectacular, although it is marginally less sandy, and there seems to be more of a dip into the sea from the immediate shoreline. However, it is a beautiful part of the coast, with a stunning backdrop of ochre cliffs punctuated by weather-wizened trees, scented shrubs and wild flowers. Apart from Cantarriján, these beaches we visited do not have bars, sun-loungers or board walks, and they are all the more special for that. It will be interesting to see how populated they get at the height of the season, but I imagine much of the population increase will be from the Spanish, out for their weekend with the family. There is no doubt, that as summer becomes firmly entrenched, we will be making regular trips down to the Maro-Cerro Gordo area, to soak up much more of the stunning natural beauty of this coastline. We are considering investing in a sea kayak, to view the coast from a different perspective, and will certainly report back! Warning! This was not quite as much fun as it looks. If this picture had sound all you would hear are loud yelps and screams.